Heat the oil in a cast iron skillet, wok, or heavy-duty sauté pan over high heat until it is shimmering and very hot. Carefully add the tomatoes, season them with the salt and pepper, and cook undisturbed for 1 minute. Mix gently and cook for another minute. Mix and cook for 1 more minute, each time allowing the tomatoes to char or brown a bit and blister, but not break apart. Remove the pan from the heat and add the honey, capers, and butter. Mix very gently until the butter melts and the tomatoes are coated. Serve immediately. Storage: Leftovers can be stored in an airtight container in the refrigerator for up to 5 days. In Recipes-list.com we have selected the most viewed recipes from category - uncategorized . Enjoy the best recipes specially selected for you! 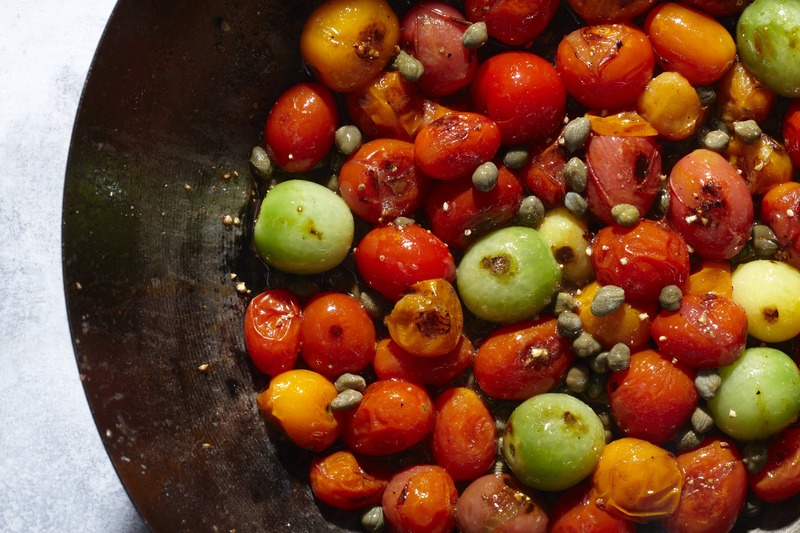 5-Minute Blistered Tomatoes and Capers is the right choice that will satisfy all your claims.